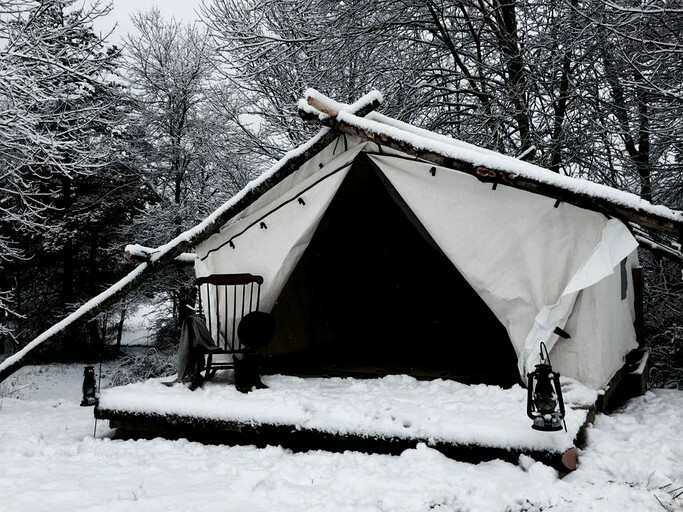 This old-fashioned luxury camping tent is located near the Mohonk Preserve, New York, and can accommodate two guests for a revitalizing getaway full of outdoor recreation, relaxation, and tranquility. 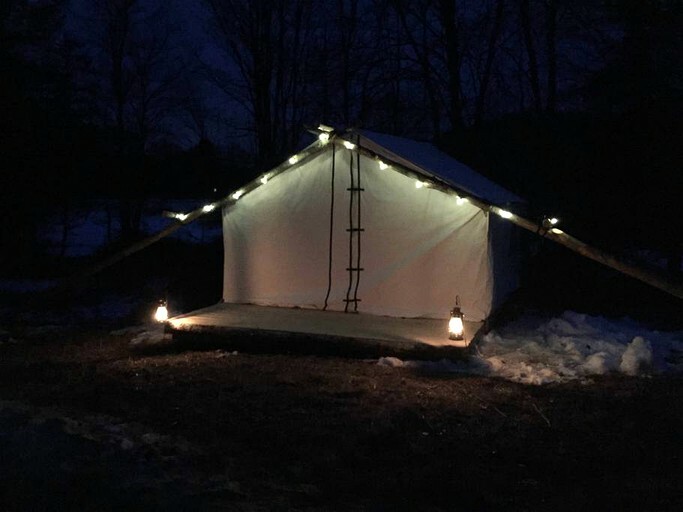 Surrounded by an idyllic natural setting on a 20-acre farm that is woven with multi-use trails and home to horses, chickens, rabbits, dogs, and cats, the tent provides guests with a chance to enjoy the great outdoors right on-site or at nearby Mohonk Preserve, which is only a 10-minute drive away. With a shared fire pit, a barbecue grill, a wood-fired pizza oven, and a hot tub, the site also allows them to kick back, relax, and enjoy each other's company in the open air. 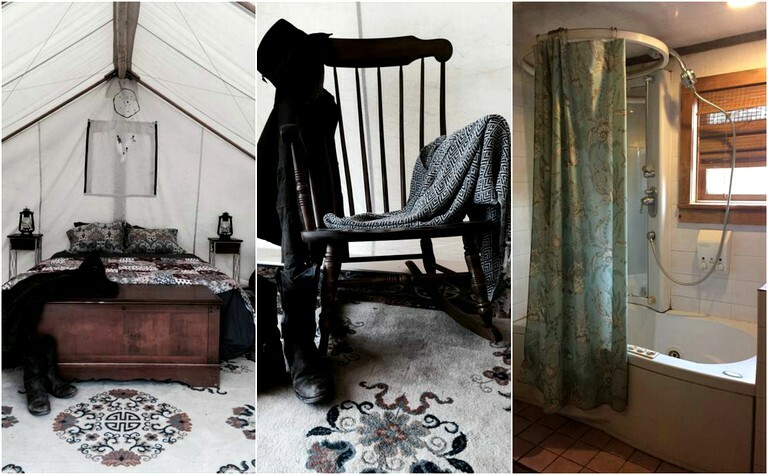 The interior of the tent is furnished with a rocking chair and a queen-size bed flanked by nightstands with bedside storm lanterns, all of which are set on a wooden platform. 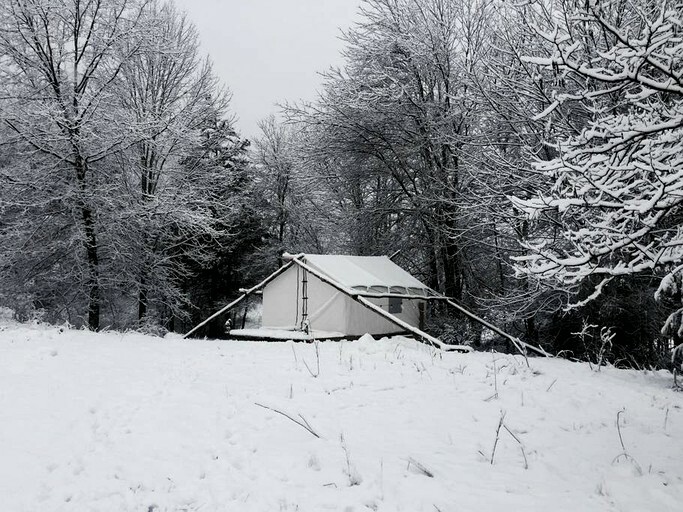 In the winter, guests can stay cozy with a mattress heater and an antique Pot Belly stove that dates back to 1901. Although guests are encouraged to unplug and unwind, they can keep their devices powered and connected with electricity and excellent cell phone coverage. Rather than a dated outhouse, guests will have access to a modern full bathroom in the hosts' residence, where they will find a combination bathtub/shower. Linens and towels are provided. 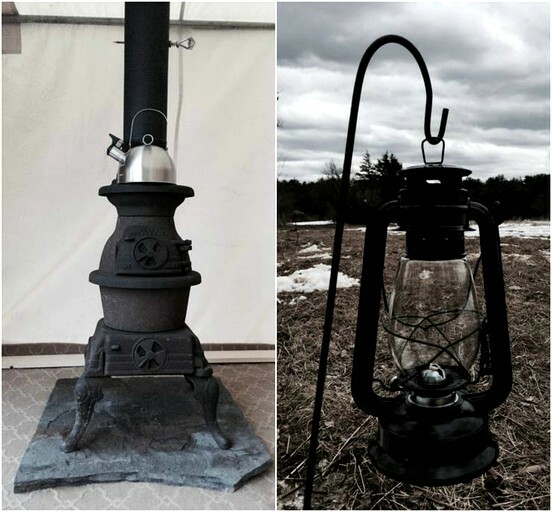 Inside the tent, guests will enjoy amenities such as a pot belly stove from 1901, a mattress heater, storm lanterns, and electricity. 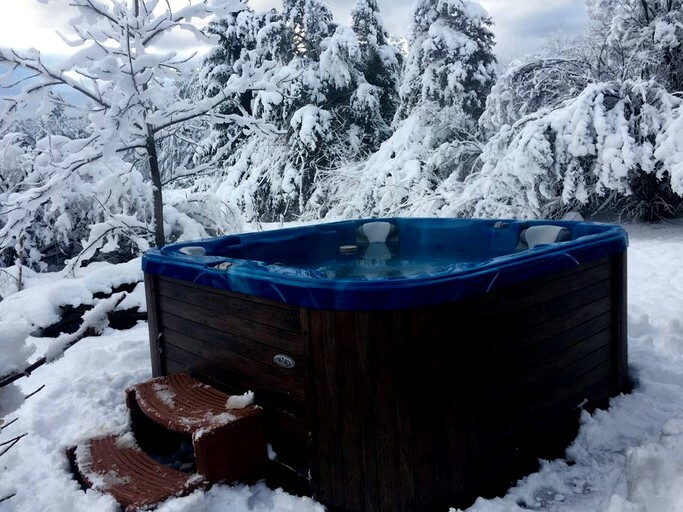 Outside, guests will find a picnic table, a barbecue grill, a fire pit, a wood-fired pizza oven, and a hot tub, as well as trails for hiking, cross-country skiing, and snowshoeing. Guests will also have access to a full downstairs bathroom in the hosts' residence. Bikes are available for guests to borrow. Parking is available on the farm's main driveway, which is about a one-minute walk away from the tent, thus preserving the tent's rural/natural setting. If guests need assistance with transporting their luggage, the hosts can provide a pull cart. Breakfast is available from the host and consists of Costa Rican coffee or tea, orange juice, yogurt, fruit, granola, eggs, bacon, and toast. 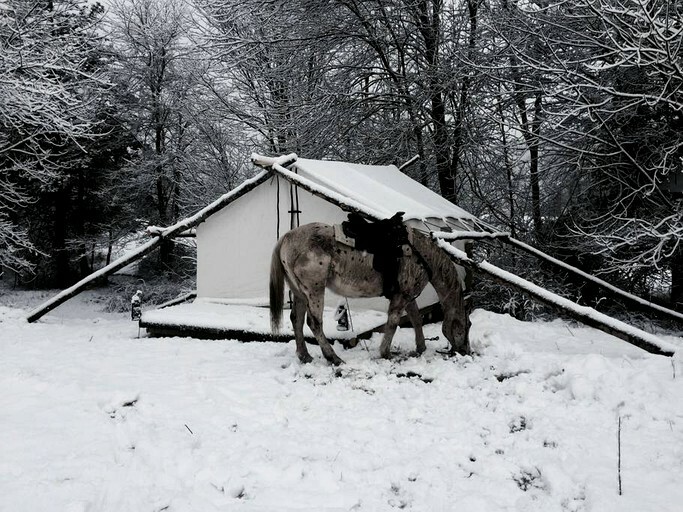 Horseback rides are available from the host as well. 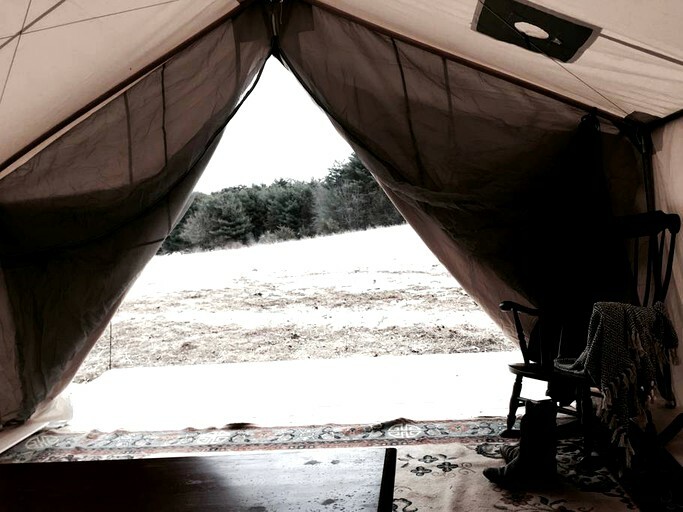 This tent is located in Accord, New York, where it is situated on an idyllic 20-acre farm that is set far away from any busy roads, providing guests with plenty of peace and quiet in a natural setting that feels far removed from the hustle and bustle of modern life. Here, guests can enjoy a sense of seclusion amid the farm's bucolic and nature-filled grounds, which are home to horses, chickens, rabbits, dogs, cats, and other farm animals and are laced with walking trails and a trout stream. 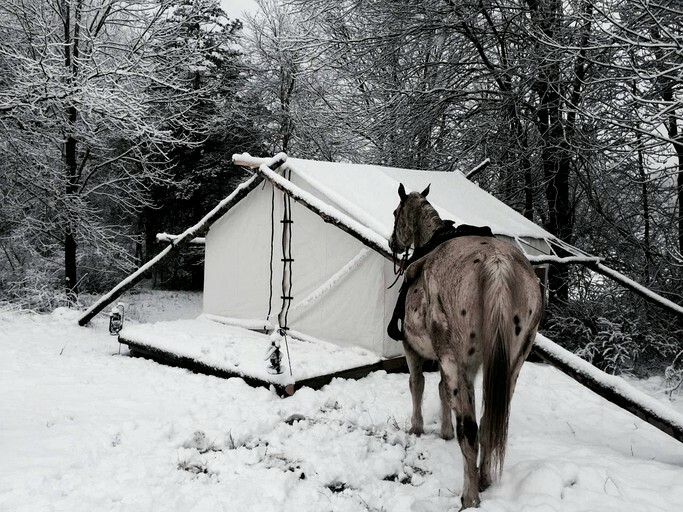 The tent is set on a hill at the edge of a field surrounded by woodlands. With its multi-use trails, trout stream, hot tub, and wood-fired pizza oven, the property is a destination unto itself. At the same however, guests will find a variety of attractions nearby. The property is within walking and biking distance of the town of Accord, Klenders Farm, Saunderskill Farm Market, and the five-mile rail trail that runs between Accord and Kerhonkson. In Accord, guests will find a wine and liquor store, two antique stores, and a pottery studio. Klenders Farm is home to a mini-golf course, a petting zoo, and opportunities for guests to pick their own vegetables and berries. At Saunderskill Farm Market, guests can purchase pastries, vegetables, and high-end groceries, or they can grab a bite to eat at the cafe. Within a 10-minute drive, guests can reach Mohonk Preserve and Minnewaska State Park Preserve. The former safeguards 8,000 acres of forests, fields, ponds, streams, and cliffs, which are laced with 70 miles of carriage roads and 40 miles of multi-use trails, while the latter encompasses 22,275 acres of rugged terrain, hardwood forests, and waterfalls. Amid the natural splendor of the state park, guests will also find three crystal-clear lakes, 50 miles of multi-use trails, and an abundance of wildlife, including white-tailed deer and coyotes. 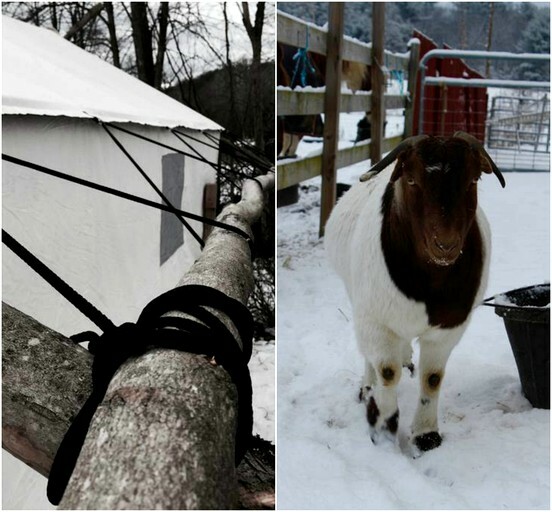 Guests can go hiking, snowshoeing, and cross-country skiing right on the trails that wind through the 20-acre farm on which the tent is located. For more hiking, as well as biking and horseback riding, guests can head to the nearby five-mile rail trail that runs between Accord and Kerhonkson. Bikes can be borrowed from the hosts, who offer horseback rides as well. 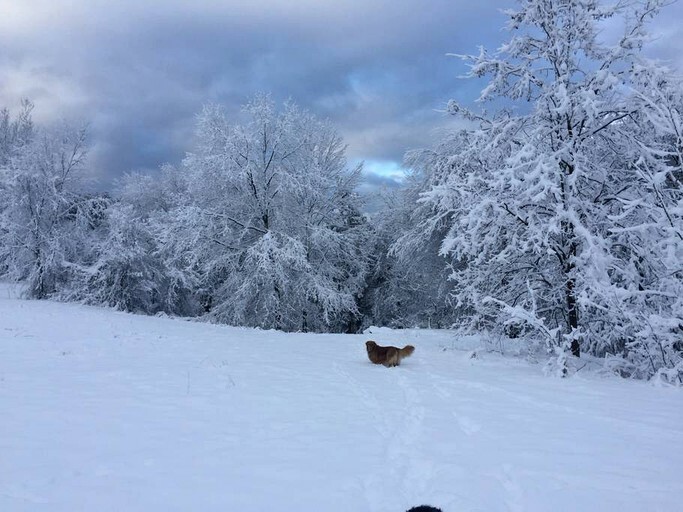 For hiking, biking, and cross-country skiing, Guests can also visit Mohonk Preserve and Minnewaska State Park Preserve, the latter of which boasts 50 miles of trails to explore. In the winter, the trails are groomed for cross-country skiing. At Minnewaska State Park Preserve, guests can also go rock climbing on the park's cliffs and boating, swimming, and even scuba diving in its three lakes. Other activity options include antique shopping in the town of Accord and visiting Kelders Farm, where guests can enjoy a petting zoo and a miniature golf course. Pets are also not permitted. Guests should bear in mind that many charming animals call the grouds their home.